Come to my house this year." My children had a wonderful time discovering treats in their shoes this frosty morning. Kitty Bill was especially excited because in his short memory there was only one other St. Nicholas Day, last year. It's so wonderful when their memories start sticking together because that's when the anticipation really starts to take on a life of its own. Last night they carefully selected carrots and apples for his horse, and Moonshine insisted they leave out a bit of chocolate for St. Nicholas to enjoy himself. In their boots this morning they each found a clementine, peanuts, and some chocolates. That's pretty standard fare for Switzerland, but even in the states, St. Nicholas left some variety of nuts, fruit, and chocolates. But as I understand it, St. Nicholas Day is actually celebrated in a variety of ways here in Switzerland. According to my neighbors, St. Nicholas makes an appearance in our village on the night of December 5th. All of the children come, and they sit and listen as he tells a story. He also calls each and every one of them out on their behavior, both good and bad. And at some point-- I'm not sure if it's at home in their shoes or at this event, they are given a sack of peanuts and clementines. 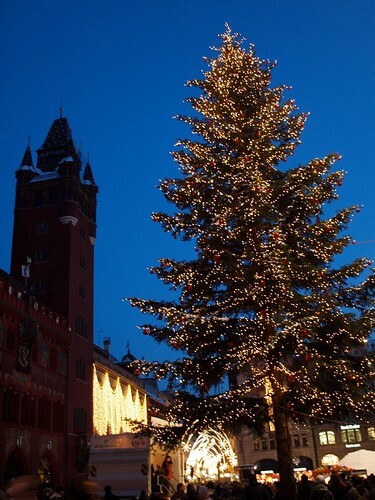 Another Swiss friend said that St. Nicholas makes an appearance at their house, coming round to greet their child. I don't know how it goes there with the shoes or not, but I find it all very interesting. It seems much more of a personal experience here than our typical shoes and stockings celebrations. After all, this is their Santi Klaus... kind of.... at least some of them call him that. The more I learn about our cultural differences, the more there is to learn. 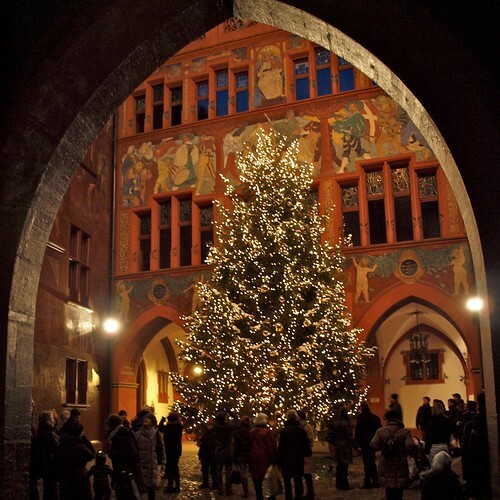 For example, the other night we braved the below freezing temps and enjoyed the Christmas market in Basel, Switzerland. It just happened to be the night of their traditional Niggi Näggi, a parade of decorated Harley Davidson motorcycles ridden by Santas. 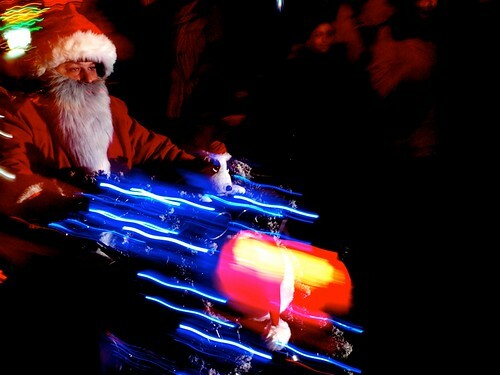 Santas on Harleys. Strange, no? However you celebrate this special day, I'm wishing you joy. Shoot! St. Nicholas day! I totally forgot. Tonight we are playing dredyl and eating latkes and lox. 'Cept I forgot about the whole kosher thing and bought ham for you know who (local carnivorous boy whose name rhymes with wooka). Oh well! Next year perhaps. Oh, and I set fire to our menorah. We have celebrated Sinterklaas (dutch) as well. We've never done the St. Nick thing, but this helps to explain why St Nick was a big deal to these Swiss colleagues of dh's. The trees are spectacular! It is so wonderful to hear your experiences~ Thanks so much for sharing.